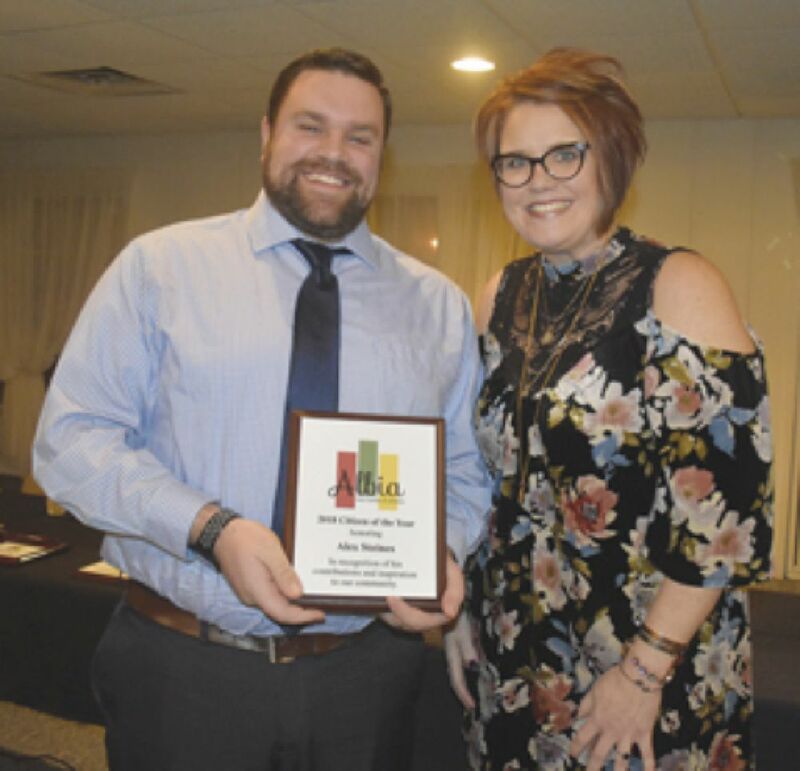 HEATHER ANDERSON presented Alex Steines with Albia Area Chamber of Commerce Citizen of the Year honors. WES AESCHLIMAN presented Heather Anderson with the Community Service Award. OUTGOING CHAMBER President Ryan Ammons presents his dad, Alan Ammons with the Merit Service Award. INCOMING CHAMBER President Cindy Cronin presents Legrand with Business of the Year honors. From left, Kevin Kearney, Tammy Griffin and Heather Flahive. 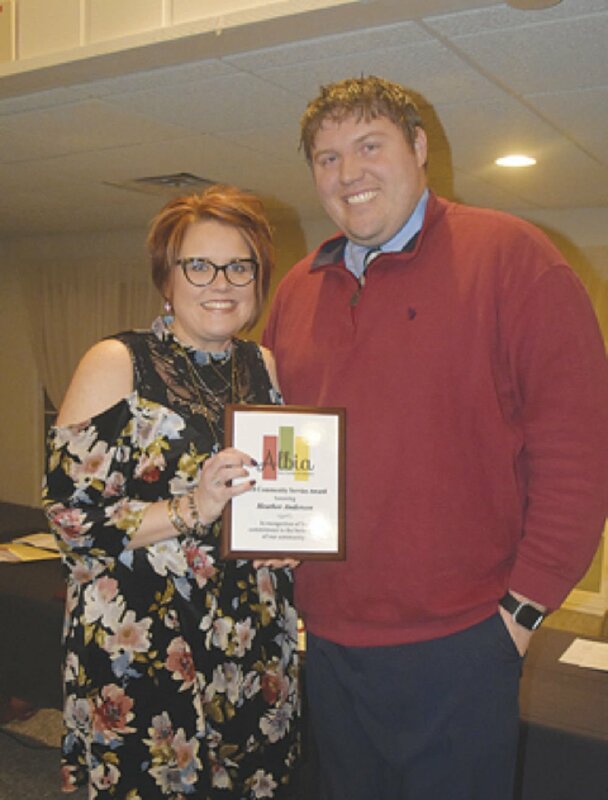 The Albia Area Chamber of Commerce held its annual meeting on Thursday, delayed because of weather from Tuesday. Four awards were presented and the new board, president and officers for 2019 announced. Alex Steines was presented the 2018 Citizen of the Year Award which is given to a person who has substantially contributed to community life through a certain project, special service or other out-of-the ordinary contribution. The award recognizes immediacy of the service and inspires people to excel in specific projects, programs or activities in the community. Steines is the vocal music teacher for grades 7-12 including mixed, concert and show choirs. He also directed the fall high school musical and helped with the ACHS speech program. Beyond that, he serves as the district’s main bus driving substitute, provides vocalists for the National Anthem at sporting events and supports the band and elementary music programs. The main part of his award was bringing two once-in-a-lifetime performances to the Albia community. An alumni of the University of Northern Iowa Men’s Varsity Glee Club, Steines was instrumental in bringing the 100-voice choir to perform at the King Opera House last winter. A packed auditorium enjoyed an incredible music experience. Working for the better part of a year, Steines led the effort to bring the incomparable Simon Estes to perform in the A Gym. Heather Anderson was presented the Community Service Award that recognizes a member of the Chamber who has demonstrated over a substantial period of time, a commitment to the betterment of the community through diverse community activities and leadership. Anderson was born and raised in Albia and after graduating from ACHS left the community to pursue college and her career. She returned after 11 years to work and live in Oskaloosa and was drawn back home to be closer to family. She joined Peoples State Bank as its marketing director and is currently marketing and HR coordinator for Chariton Valley Electric Cooperative. She has taken on leadership positions in the Chamber’s valentine’s family party, Restoration Days and Victorian Stroll, was part of the group that brought the Chamber rodeo back to Albia in 2016 and belongs to Rotary Club, the Victorian Stroll Committee and the Albia Trails Committee. She has also been active with Welcome Home Soldier, Shoppes of Victorian Albia and Prosper. She is a member of St. Mary’s Catholic Church and president of the Altar and Rosary Society. Anderson was involved with both RVTV in September and the Simon Estes concert in October. Alan Ammons received the Merit Service Award which is presented to a Chamber member who has demonstrated long-term commitment to the purposes of the Chamber, through actions which support the Chamber. Ammons is also a native Albia, joining the U.S. Navy and serving four years before earning a degree in farm operations from Iowa State University. He spent 24 years in the Navy Reserve, retiring as a Master Chief, the highest rank for an enlisted sailor. Ammons and his wife, Susan, opened Hawkeye Farm Management and Real Estate in 1989, after returning to Monroe County from California. He has served on the Farm Bureau Board, the Farm Service Agency County Committee, was an Albia Community School Board member during the vote to build the new high school and led the board’s search in hiring a new principal and superintendent. He is an active member of the First Christian Church, served on the Chamber Board, the Monroe County Hospital Board and serves as a speaker for the American Legion for Memorial Day and other veteran’s events. The Business of the Year honors a business that has invested in the community’s future, demonstrating a long-term vision for the community. The business engages in teamwork to achieve community goals and is successful in identifying and meeting the needs of the community. This year’s recipient was Legrand. Legrand joined the community in March of 2014 when it acquired Quikton, Inc. It currently employs 34 full-time sales and operation workers at their B Avenue West location. The company is a global leader in network infrastructure solutions, with products designed to support data centers, building networks with audio/video applications. Based in France and headquartered in Connecticut, it is comprised of multiple divisions and business segments focused on transforming spaces where people live and work through power, light and data. Employee and community welfare is one of three corporate strategic pillars of Legrand and is heavily focused in its Better Communities Program and CARE Council. Through those entities, Legrand has sponsored the Chamber rodeo, annual golf outing, Restoration Days, Victorian Stroll, Oktoberfest, KIIC Easter Egg Hunt, Albia Booster Club, ACHS yearbook, Albia Rotary Trivia night and Monroe County Wellness Coalition. Legran employees built the ISU shed for RVTV and donated the proceeds to Homes for Heros. The company has also donated to ACHS senior scholarships, Monroe County Cattlemen, Welcome Home Soldier, Monroe County Little League Sofrtball, T-ball and soccer, St. Patrick’s annual golf tournament, Albia Head Start, Helping Hands, Mary Sauter’s Pay it Forward, NEST, Albia Vet Clinic, King Opera house and nursing homes and assisted living. It has also offered its facilities for the Pay it Forward program, The Victorian Stroll Committee and the new ACHS ASPIRE class. Ryan Ammons was presented the past president’s gavel from incoming Chamber President Cindy Cronin. Retiring board members included Kim Wilson and Stephanie William. The 2019 officer team includes Cronin, president, Ammons, past president, Adam Mick, vice president, West Aeschliman, treasurer and Kaytlyn Waters, secretary. Returning board members include Brent Yager, Kay Spieler, Ann Kerber a nd Allyson Ryan Haberman. Joining the board will be Christine Wilson, Doug Wolfer and Tonia Benson. Lora Teno is the Chamber’s Executive Director. She described some of the Chamber’s main events including Community Coffees, Lunch and Learn, Lunch in the Courtyard, the Family Valentine’s Day Party, the Monroe County Rodeo, the annual golf outing, the Ugly Sweater Party and support for Rodders Car Show, Restoration Days and the Victorian Stroll. The Chamber also hosts a number of bus tours and serves as the clearing house for people interested in the Albia and Monroe County community.